Data from Vinexpo via the IWSR reveals that the US is currently the leader of global value growth in both still and sparkling wines, and forecasts that the US will only increase its global lead over the next few years, jumping from $34bn in total sales in 2016 to a forecasted $45bn in 2021. Sparkling in particular is a huge growth market for the US. 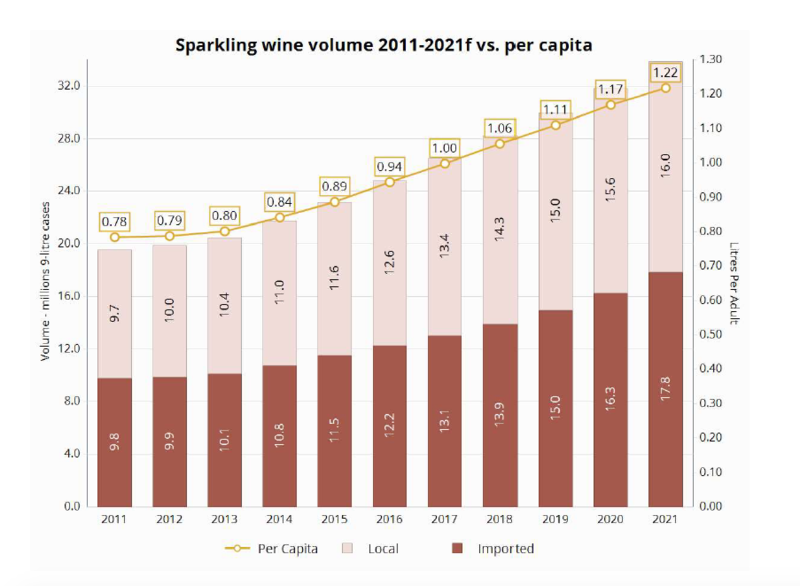 The States are expected to be the driving force behind a forecasted 2% average year-on-year growth of the world’s total sparkling wine market to 2021. Such growth is expected to mean that the UK will no longer be the top fizz importers, although sales of fizz will continue to develop strongly and we will hold onto our title as the top global consumers of Prosecco. The US will be second. As well as remaining the firm global leader for value sales, the US is also expected to continue to lead world wine volume growth in 2017 for the 23rd consecutive year when final numbers are totalled. By contrast, European heavyweights – France, Germany and Italy – declined in value and volume in 2016, continuing a long-running trend. By 2021, US sales of still and sparkling wines are expected to reach just over $45bn - 20% of a global market worth $224bn (2.66bn cases). The top imported country of origin to the US between 2016 and 2021 will be Italy, despite a 1% drop in volume expected over the five-year period (25.5 million 9-litre cases were imported in 2016). However, New Zealand will be the stand out growth performer, expected to grow 9.9% to 2021; and also France (+2.8%). The US will also be a key generator of growth in global spirits. According to Vinexpo, premium spirits are forecasted to grow from a small base by on average over 5% per year between 2016 and 2021, while ‘super-premium+plus’ categories are due to outstrip premium spirits, growing on average over 7%. Scotch, US whiskey and gin are expected to grow as the global spirits market diversifies, driven by premiumisation.